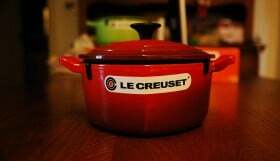 Ten days ago I shared my idea for giving back to the food community by offering one food writer the chance to win a 5.5qt Le Creuset Dutch oven, but that wasn’t a choice I wanted to make alone. 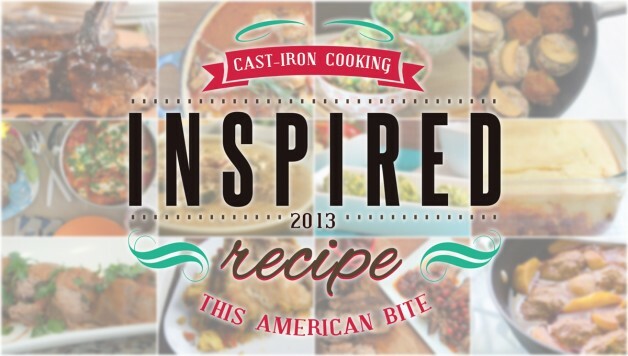 I wanted to hear which recipes had most inspired you over the last 12 months. Your nominations have been amazing to look at, and I have discovered some cool new food writers in the process, so today is the day. I’m unveiling my top 13 recipes of the year. Take a look at the recipes below and then use this entry form to tell me who you would like to see win. 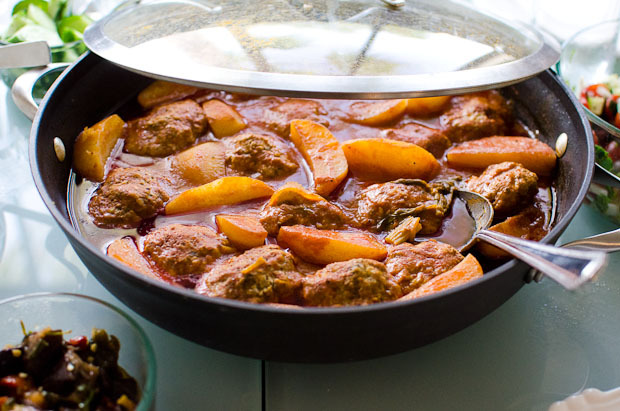 The author of the best recipe will win a 5.5qt Le Creuset Dutch Oven and one person will win a copy of Jerusalem: A Cookbook. Coffee, lamb, balsamic reduction. What’s not to love? Melinda of Kitchen Tested always brings a fresh approach to food, especially lamb! She has an amazing way of creating unthinkable Gluten Free desserts. For the record, Melinda deserves an honorable mention as she was also nominated for her Strawberry-Jalapeño BBQ Sauce Chicken Wings. See what I mean about talent? Whitney of Jewhungry is another food writer to receive multiple nominations for this award. I chose this shakshuka recipe to represent the most inspiring recipe of the year but you also nominated her Cilantro, lime and cauliflower couscous. I think arborio rice is one of the ultimate comfort foods, and Rhubarb and Honey was nominated for this pressure cooker “risotto”. With two types of mushrooms and depth of flavor coming from parmesan, garlic and chives, what’s not to love here? Chanie at Busy and Brooklyn is another food writer I admire, and so do you. This vegetarian chili pie with cornbread is the ultimate one-pot meal. Honorable mention for her double nomination too — you also suggested her butternut squash fries. Chanie is a very talented food photographer and I am pleased to see her nominated! I remember drooling over this photo when Sina of The Kosher Spoon first shared this meatball recipe in May. I was so pleased to see it included in your nominations! Thank you. Check out all the pictures of this recipe, then tell me how much you want to be invited over there for dinner?! Amy of What Jew Wanna Eat knows brisket, and this how it’s done. The combination of her spice rub and her braising liquids… I can’t begin to imagine what this dish tastes like. Don’t wait till next Thanksgiving to serve this with a side of cranberry sauce. Do it now! 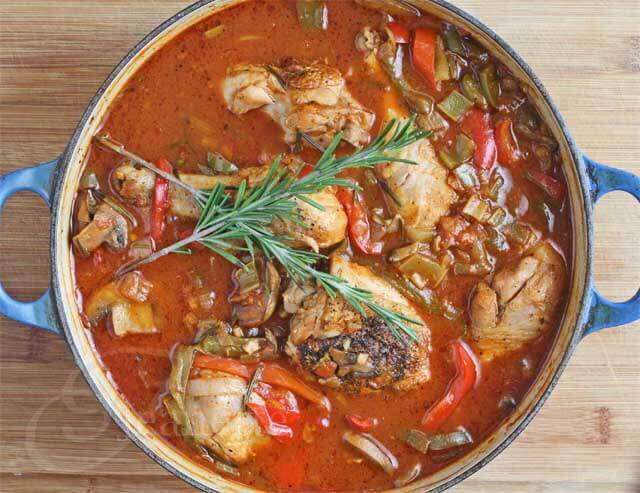 I do love chicken cacciatore, and I promise that this dish being presented in my favorite pieces of Le Creuset cookware is not the only reason for it’s inclusion! Check out the colors of this dish! I can only imagine how this must smell as it cooks. 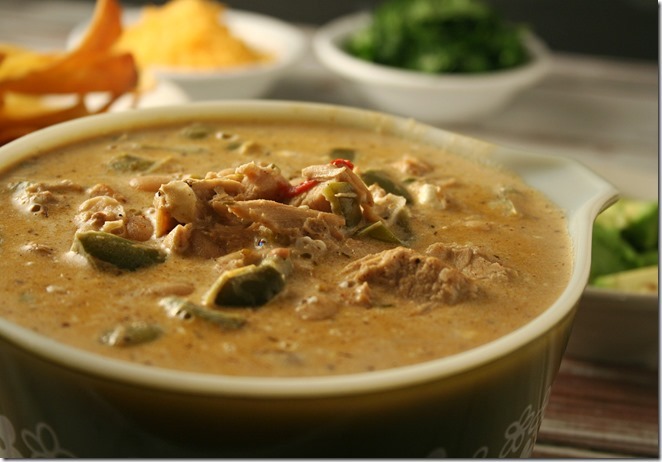 Congrats, Jeanette, this is a great looking recipe! Vicky and Ruth of May I Have That Recipe may have mastered baked falafel. Huge props go to you guys for making this a gluten free recipe, and baking rather than frying. I love the color of these falafel! Allyson, also known as the Domestic Superhero, has a great selection of quinoa dishes, and I admire that! I always struggle to cook with quinoa, it can be hard to infuse it with flavor. 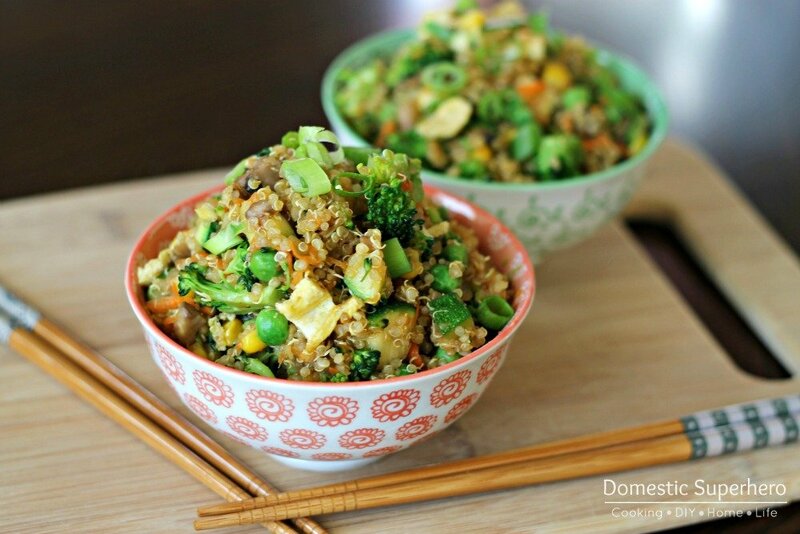 Next time I make quinoa, it will be Allyson’s quinoa fried rice. Doesn’t it look delicious? Holy Cow’s Vaishali has the Tikka Masala Pot Pie I have been looking for! It’s the perfect British-Indian fusion dish! As soon as I have a handle on my gluten free pie crusts, I’ll share my own version of this dish. 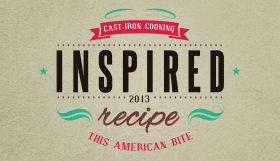 I am so excited by this recipe that I have goosebumps! This Spicy White Turkey Chili by Tammy of Yours and Mine are Ours is the only recipe I am sharing that may need to be tweaked a little for the kosher kitchen. It looks amazing and the ingredients include some of my favorites. If I was making this in a kosher or dairy free environment, I’d skip the butter and use thick, whipped coconut milk instead of the dairy. Meatballs = happiness. I love how Sarah of Food, Words and Photos shared two presentations of her apple and sage meatballs, and this recipe reminded me of the turkey apple sausage bites I made earlier in the year. Ground turkey is really an under-rated ingredient. High Five Sarah, thank’s for this recipe! Cindy wowed me this this spinach stuffed braciole, then I saw it was a slow cooker recipe and I was sold. This popular Italian dish is way more than a meatloaf. Look how perfectly cooked the meat is in that photo! Mouthwatering! Voting closes on January 8, 2014 and you can vote daily.